In 2015, Polish political actors and society faced the challenge of “double elections” for the second time since the transformation of the political system in 1989. It happened for the first time in 2005. The accumulation of two elections in one year was not the only similarity between the 2005 and 2015 elections in Poland. In fact, the 2005 elections provided many contextual factors determining the course of the election campaigns, including fierce competition between two political parties: Prawo i Sprawiedliwość and Platforma Obywatelska. 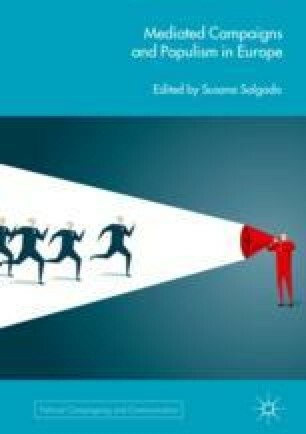 This chapter discusses the findings of the analysis of the media coverage of the 2015 parliamentary election in Poland. The findings showed that the media mirrored the political scene by focusing on inter-party relations and campaign tactics, as well as framing politics as a strategic game. The data also supports previous observations on an interpretative model of Polish journalism. The study is financed by the National Science Centre, Poland, grant ID: 2015/18/M/HS5/00080. CBOS. (2015). Polacy o uchodźcach—w internecie i “realu” [Poles on Refugees—on the Internet and “in Reality”], no. 149. Retrieved December 4, 2016, from http://www.cbos.pl/SPISKOM.POL/2015/K_149_15.PDF. Cybulska, A. (2015). Poparcie dla kandydatów w wyborach prezydenckich [Support for Presidential Candidates]. Komunikat z badań CBOS, no. 28. Retrieved January 14, 2017, from http://cbos.pl/SPISKOM.POL/2015/K_028_15.PDF. Gemius. (2015). Wyniki badania Megapanel PBI/Gemius za listopad 2015 [Results of the Megapanel PBI/Gemius Study—November 2015]. Retrieved February 18, 2017, from https://www.gemius.pl/wszystkie-artykuly-aktualnosci/wyniki-badania-megapanel-pbigemius-za-listopad-2015.html. Kaczyński, J. (2015). Stawka jest bardzo wysoka. List do członków PiS [The Stake is High. Letter to the Members of PiS]. Retrieved January 11, 2017, from http://niezalezna.pl/63950-stawka-jest-bardzo-wysoka-list-jaroslawa-kaczynskiego-do-czlonkow-pis. Kopacz, E. (2015). Przemówienie premier Ewy Kopacz z Konwencji Platformy Obywatelskiej RP [The Speech of Prime Minister Ewa Kopacz at the Convention of Civic Platform]. Retrieved January 11, 2017, from http://www.platforma.org/aktualnosc/42422/przemowienie-premier-ewy-kopacz-z-konwencji-platformy-obywatelskiej-rp. KRRiT. (2015). Rynek telewizyjny w II kwartale 2015. Retrieved January 10, 2017, from http://www.krrit.gov.pl/Data/Files/_public/Portals/0/kontrola/program/tv/kwartalne/rynek-telewizyjny-w-ii-kwartale-2015.pdf. Kukiz, P. (2015). Retrieved August 19, 2017, from https://www.facebook.com/kukizpawel/posts/958933797507674. W polityce. (2015a). Piechocińskiego sny na jawie [Piechocinski’s daydreaming]. Retrieved January 11, 2017, from http://wpolityce.pl/polityka/244923-piechocinskiego-sny-na-jawie-marzy-mi-sie-wielka-koalicja-po-pis-psl-z-psl-em-na-czele-pobudka-moze-byc-przykra. Wirtualne Media. (2015a). “Wiadomości” TVP1 liderem oglądalności programów informacyjnych [“Wiadomości” TVP1 – A Leader of Viewership among Newscasts]. Retrieved May 6, 2015, from https://www.tvp.info/19950237/wiadomosci-tvp1-liderem-ogladalnosci-wsrod-programow-informacyjnych.